Rick Skunk March 22, 2019 No Comments on FunkyPiece Spring Cleaning Sale! 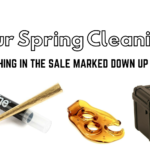 We are doing a little spring cleaning here at FunkyPiece and some really awesome products are marked down up to 40% OFF! Check some of them out below and see the rest on our website! Happy Spring!